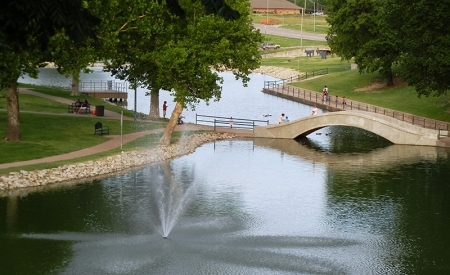 One of Enid’s first parks established in 1911 is where the Oklahoma Land Run and Chisholm Trail meet! Interpretive public art at Dillingham Gardens tell the tale of the Land Run at this historic Chisholm Trail watering hole. And who expects a waterfall on the prairie? Facilities include (5) park shelters, restrooms, walking trail and fishing docks. This park is equipped with one large pavilion that can be rented for weddings, concerts and other festivities. Government Springs Park also has plenty of play toys for the children.